The DVD for the (ambitious but lukewarmly received) Bob Dylan biopic, I’m Not There, comes out on Tuesday, May 8, and in honor of its’ release I’m giving away a copy of the very impressive double CD soundtrack to the film. 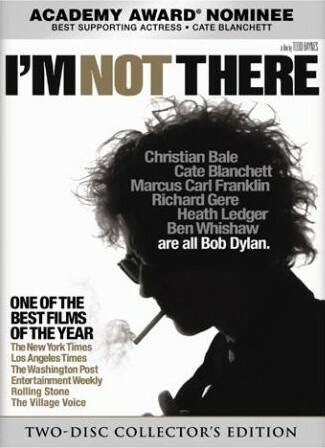 To win a copy of the I’m Not There soundtrack, send an email to contests@bumpershine.com and tell me which actor played your favorite Bob Dylan in the film (or if you didn’t see it, you can make something up). A random winner will be picked at the end of the week. The two-disc, 34 song collection includes newly-recorded cover versions of Bob Dylan songs from the film celebrated contemporary musicians including Eddie Vedder, Sonic Youth, Stephen Malkmus, Cat Power, Sufjan Stevens, John Doe, Karen O, Jeff Tweedy, Willie Nelson, Antony, Glen Hansard & Marketa Irglova and more. I’m Not There includes the original Bob Dylan recording of the song, a rare oft-bootlegged outtake from 1967 which has never been available on any official release. Full I’m Not There tracklisting after the jump.